Lions players Tim Walton and Eddie Murray, as well as The Empowerment Plan's Erika George and Veronika Scott, distribute coats to veterans in need. 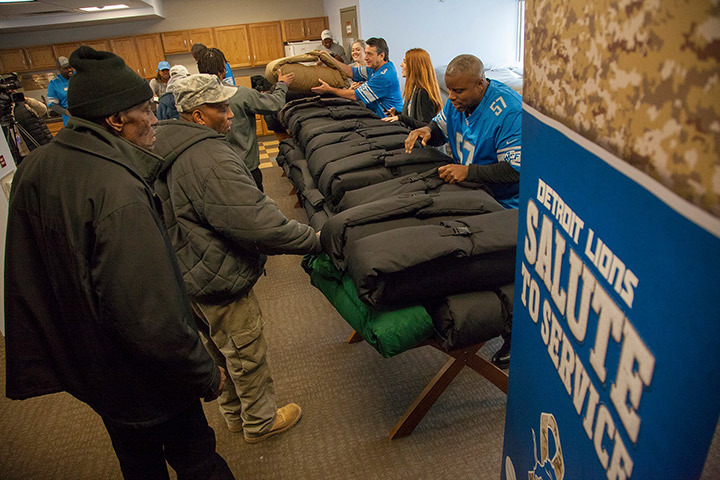 At our Piquette Square for Veterans, the Detroit Lions teamed with The Empowerment Plan and Southwest Solutions to provide special coats to veterans who are homeless or at-risk of homelessness. The event was part of the Lions’ Salute to Service Week. Five Lions legends were on hand to distribute the coats made by The Empowerment Plan. The coat converts to a sleeping bag. The five Lions players were Lomas Brown, Scott Conover, Eric Hipple, Eddie Murray, and Tim Walton. See the photos on Facebook.